Located on the west bank of the Chao Phraya, The Peninsula Bangkok’s distinctive wave-shape architectural design provides spectacular river and skyline views. The Peninsula Spa is 19,070 square feet and offers a wide range of wellness facilities, treatments — including Thai, European and Ayurvedic therapies — and portion-controlled healthful cuisine. The hotel’s spa facilities, three-tiered swimming pool and fine dining restaurants will please both business- and pleasure-focused travelers. Guests are also within close distance of the city’s business and shopping districts. The Peninsula Spa is housed in a three-story colonial-style building and has 18 treatment rooms, including two private suites and two river suites with dual hydrotherapy baths, steam rooms and rain showers. The spa is elegantly decorated with Thai silk fabric, wood accents and red bricks. The spa also features a tea lounge, cold-plunge pool, Jacuzzi and saunas and steam rooms. The comprehensive therapy menu offers bespoke, customized services reflecting Thai, European and Ayurvedic philosophies. Signature experiences include the Time Treatment that begins with a traditional tea ceremony, consultation with a therapist and welcoming foot ritual. Treatments are based upon guests’ needs and include therapies such as massage, Shirodhara and rejuvenating facials. Additional services designed to entice include a back, face and scalp massage with volcanic stones. Spa visitors must be 16 years or older. 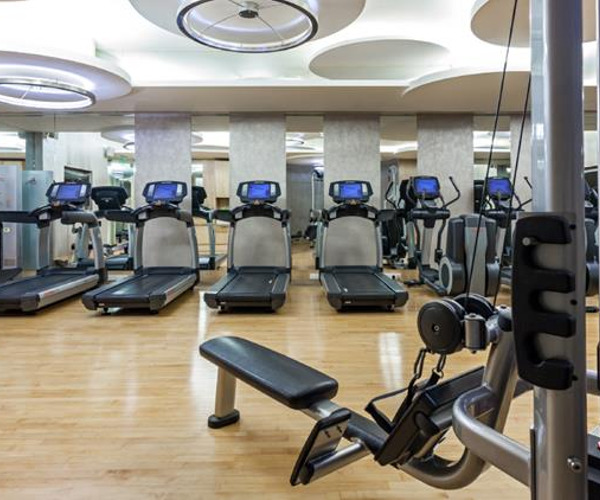 The hotel’s 3,000-square-foot fitness center offers a variety of exercise equipment, as well as fitness instructor and Muay Thai boxing classes. Tai chi and private yoga sessions are available upon request. Adjacent to the wellness facility are two floodlit tennis courts and a three-tiered outdoor swimming pool surrounded by serene teak wood gazebos. Children’s programs like “Junior Chef” and “Diva for a Day” cater to young travelers, while Peninsula Academy Programmes provide guests the opportunity to learn about the local culture, including cuisine, classical dance and traditional massage. Nearby sightseeing spots include the Grand Palace, where the Wat Phra Kaew houses a 500-year-old Buddha statue, and Wat Pho, a temple with a 50 foot-high reclining Buddha. The Peninsula Bangkok's 370 rooms and suites feature river and city views. A luxurious Asian aesthetic prevails, integrating elements such as pale-green wood furnishings and fabrics that recreate traditional Thai silks. Each room’s bedside panel gives guests touch-of-a-button control of lighting and temperature. In addition, high-speed Internet access is complimentary. Marble bathrooms have hands-free telephones, mist-resistant televisions and oversized soaking tubs. The hotel's four restaurants showcase a wide range of cuisines, including Mei Jiang, specializing in fine Cantonese cuisine. The River Cafe and Terrace is an all-day dining venue that offers river views either indoors or alfresco. 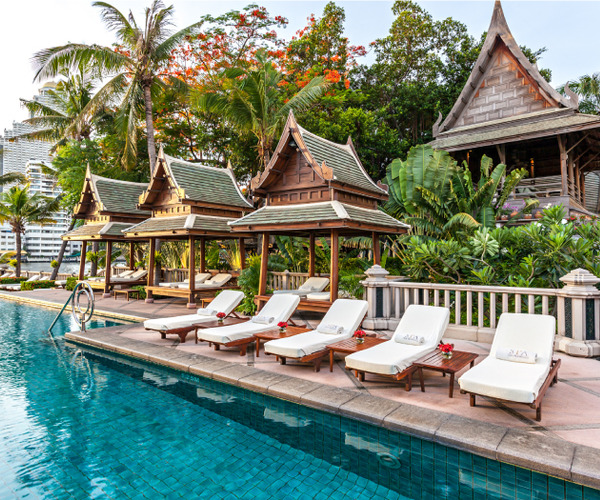 Located on the riverbank, Thiptara features authentic Thai sala (teak wood house) and offers local delicacies in a tropical garden setting. The Lobby is a popular gathering spot for breakfast, light fare and traditional tea. The River Bar and Pool Bar offer drinks and snacks throughout the day.